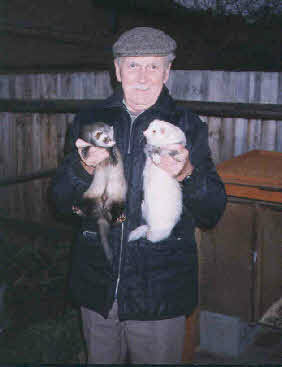 Here Dad is holding Titch and Frank. When Pinkie died, Mum told me a woman knew of a ferret at an animal rescue requiring a home. I telephoned, then visited the T L C refuge were I was shown Frank. I liked him from the start with the patch work of colours that formed his fur coat. Also he was a neuter. His tail being short added to his comical look. When I took him home, Mum thought how funny he looked. I must admit he seemed to be bit of an odd ball. He was always ready for a game. I recall sitting in the armchair and feeling a thud against my hand as he leapt at it. Dad had fetched him in, catching me unaware. Titch and Frankie would get along very well, but Titch would get fed up with his ‘attacks’ and send him packing. Sadly Frankie became ill after his cage became saturated by rain, giving him antibiotics and keeping him indoors he began to recover. But wrongly I thought he was fit enough to return to his cage outdoors, the breathing illness returned and sadly he died.